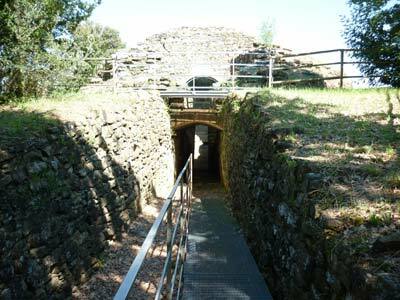 Even if you aren't that fond of archaeology, these etruscan tombs are a special experience and well worth a detour before or after you visit to Vetulonia. There are no gold artifacts on display or painted murals to be seen but, as is the case with many of Maremma's historic sites, they are set within stunning Tuscan countryside and you will probably have them all to yourselves as we did - even in the height of summer. 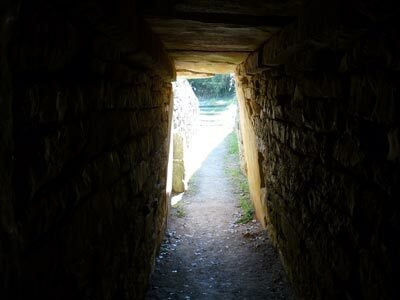 The five year olds with us were enthralled and when we had visited all of the tombs wanted more "dark holes" to explore, even if they were scary! This site makes for a great introduction for them to archaeology, Etruscan or otherwise. This is the route that we took, which I would recommend in terms of car parking provision - there is only one place (see the Google satellite map below) - and, particularly, if you have young children with you. As you approach Vetulonia and the summit of the hill upon which it sits - with gorgeous panoramic views for any of you in the car not driving! - the road along which you will find the monumental tombs - the "Via dei Sepolcri" - is marked by a sign on your left. Take the left turn, and descend the same hill down a country lane - passing the Tomba del Belvedere immediately on your left. About 100 metres on your right you will find a car park with an information hut adjacent to the first tomb: the Tumulus of Pietrera. If the hut is closed (it often is) you will find printed information sheets in English (and other languages) outside on a small table. Entrance to all of the tombs is free. The gate entrances are opened at and closed at 10:00 and 18:00, respectively. The tomb of the Pietrera is the largest funeral monument in Vetulonia and is unusual in that it comprises of two tombs: the second built upon the collapsed structure of the first. 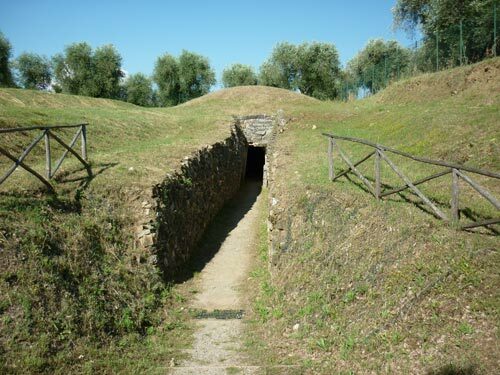 "Among the great discoveries of Isidoro Falchi, the tireless researcher of Vetulonia, mention must be made of the large tumulus of Pietrera, one of the major tombs in Etruria and the most complex tomb brought to light in Vetulonia. Consisting of a large artificial hill, surrounded by a probable drum approximately 60 metres in diameter, it stands about 14 metres off the ground. Its discovery in 1882 underwent subsequent changes in 1891-1893 and afterwards in 1925-1926. The tomb comprises of a main room featuring a rectangular plan, a central pillar and an arch which must have been projecting masses, to which access is gained through a long corridor onto which two lateral cells open out. This initial construction, which perhaps dates back to the early 7th century B.C., was obliterated, perhaps due to a sudden collapse, by another structure, that was identical to the former: it can be dated back to the late 7th century B.C. and was built on the original tomb. At the end of the last century the whole tomb complex was restructured also introducing new building materials, including used bricks also to rebuild the vault, altering the overall appearance of the monument. Moreover, this tomb not only contained rich imported and local ceramic sets and gold work, a famous sculpture comprising male and female statues which, albeit only partially preserved, are one of the oldest examples of stone sculptures in Etruria." The photograph at the top of this page is an external view of the Tomb of Diavolino II. "The Vetulonian monument of Pozzo dell'Abate or Diavolino II is one of the most famous works of funerary architecture of the northern Etruria and the most magnificent tholos tomb in Vetulonia. Although it has been quoted in several bibliographic sources, it has not ever been subject of systematical excavations. After the first participation of Isidoro Falchi in 1884, concerning the bringing to light of a small part of tambour, the excavation of the structure was resumed only in 1903 the year during which the central room was brought to light, but the discovery of few fragments of the funerary outfit disappointed the hope to find rich discoveries and caused the rapid running out of the researches. The restoration of the tomb had to wait til 1960, when the Soprintendenza Archeologica provided for the execution of strengthening works for the structure of the tomb, which continued in successive stages til 1969. 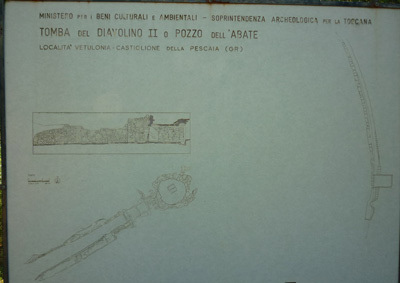 Regular participations which aimed to the recovery and to the restoration of the monument began thanks to the financing F.I.O., inside the program "Cities and Necropolis of the Etruscan land" in 1983 and continued in 1985. The monument finds its right chronological collocation at the end of the VII th century B.C. in a particularly important moment for the history of Vetulonia." The tomb of Diavolino I was dismantled in the 1800's and reconstructed in the gardens of the Archaeological Museum of Florence, which contains some of the most important collections of Etruscan art in the world - entrance also free. This tomb is marked as furthest along the lane, and the signs take you along an unkempt path in private land. Perhaps because it was June and the growth in the field in which we arrived was thick and high, but despite searching we found no trace of the tomb, or further information plaques or boards. So, I'm leaving this one for you to discover! unless I find it when we visit next, in which case I will update this page. Its name comes from the precious gold brooch - decorated in gold dust and with animal figures - found within the funeral trousseau within the tomb and now on display at the Isidoro Falchi Archaeology Museum in Vetulonia. It apparently has a "dromos" entrance into a four-cornered room, the structure of which is evident until where the pseudo-dome commences. If you pick up you car and drive back towards Vetulonia, the Tomb of the Belvedere can be found on your right at the top of the lane. The reason that I recommend that you visit it last, is that if you do have children amongst you and they visit this excavation first, you are unlikely to gather a great deal of enthusiasm for them to want to continue and walk down a country lane to find lots more! 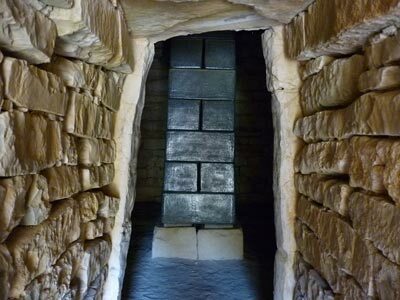 But visit the other tombs first and my experience is that, although they might be getting a bit tired of Etruscan archaeology by the time you get there, they are likely to give in for one last stop! Just my ten cents worth! This tomb has a short dromos entrance - so lacks the drama for kids of the longer deep entrances of the others - but the low lintel is still intact. The niches within the funeral room itself would have been home to human remains. 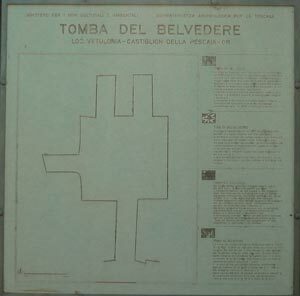 "Discovered between May 10 14 1897, the Belvedere tomb consists of a square chamber with three side rooms. 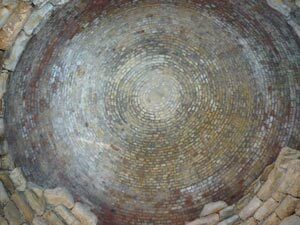 At the time of its finding, the vaulting-made of large overlapping stone slabs was still partially visible. Already in antiquity, this must have suffered displacement, as demonstrated by the supporting column of fluted marble still in place at the time of its discovery and now lost. The few finds in the tomb suggest that it was used again in the second century B.C. A date between the late 7th and early 6th centuries B.C. can be assigned to the tomb on the sole evidence of its architectural features." 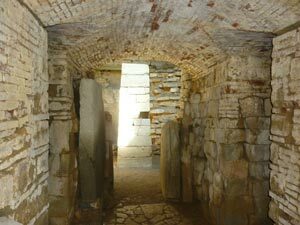 You can read more about the Etruscan tombs found at Vetulonia and Etruscan civilization in Maremma in the Parco degli Etruschi web site: the link will take you to the menu page in English. Read about the one hundred and four Etruscan tombs and necropoli that have been discovered around the beautiful freshwater lake of Lago dell'Accesa set within the wooded hills of the Macchia del Monte: another great place to explore and entirely free.